I came across a Ciabatta and thought; ‘that’s a good looking Ciabatta; it would be nice for dinner’. I don’t bake much yeast breads because ones you start with sourdough you want to feed it and use it, over and over again. But, today I’m going for this beautiful yeasted Ciabatta by Craig Ponsford. 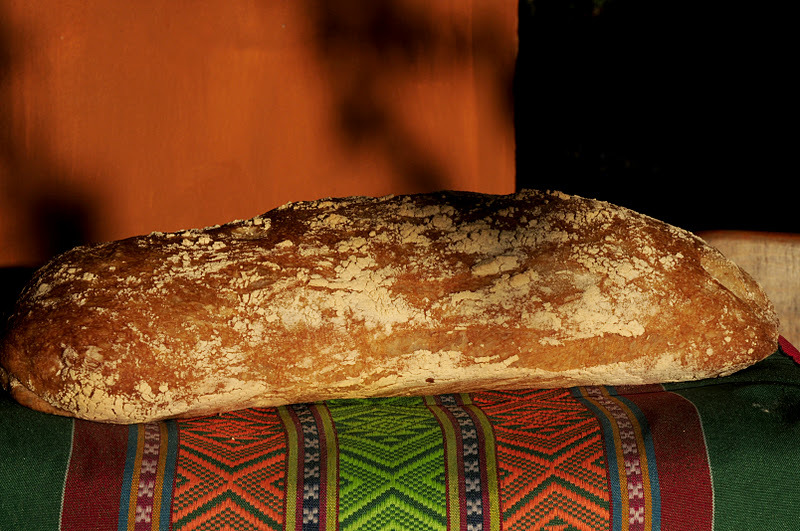 Maggie Glezer writes about him and his recipe for Ciabatta in her book ‘Artisan Baking’. I had a look at his shop and saw an interview about honest bread and educating his customers. For this Ciabatta you use a multigrain starter which is made the day before baking day. The next day you need patience, but what’s new with baking good bread, even though this is yeasted bread. Patience when you knead it by hand; it takes time and energy. You need patience when you see that beautiful big lump of bubbly dough and gently put your hands underneath to transfer it to parchment paper on a peel. Happy when you wait in front of the oven window and see it grow. Smiling when you see it turn from white to a nice brown color. And you need patience when you smell it and want to taste it. I’ve baked Ciabatta before. The first wet dough drove me crazy, really it did. The dough is wet, pouring wet. Now I know to wet your hands before touching wet dough, now I know how to ‘knead’ wet dough, now I know how to stretch and fold wet dough and now I know how to handle wet dough from the couche to the parchment paper and into the oven. Now I know and now I love it! The feeling of this dough is so soft and you need to handle it with great care. Because I wanted to bake one Ciabatta in stead of two, there wasn’t enough dough for my mixer. I had to knead it by hand. It has nothing to do with kneading because it’s pouring wet. I followed the instructions for very wet dough. When all ingredients are combined pour the dough on the floured counter. Don’t forget to place a bowl with some water close by. I decided to use one hand, in case I had to do something urgently. I'm sorry this hand couldn't take enough photos. This is how it’s done: grab the dough, lift it and smash it on the counter with a bang. Repeat this as long as the dough looks like thick batter. After a while, really, the dough changes and gets more strength. When you lift it you will see the dough-ball is cleaning the counter. But it stays (with me) very wet. I read the technical term is ‘gloppy’. Don’t stop too soon; it’s tiresome but rewarding in the end. Then I transferred the dough to a bowl and let it rise for 3 hours. The first 80 minutes I stretched and folded it 4 times (every 20 minutes). Stretching and folding in this case means: you just scoop it around and around. I use a plastic spatula and took a bit of dough from the bowl, lifted it and scooped it to the centre. And I did this a lot of times. Then I left the dough to rise without disturbance for about 1 hour and 40 minutes. Then it was time to place the dough on the thick floured couche. I just scraped it out of the bowl. With the couche I ‘shaped’ it. Covered it with a towel and left it there for more than an hour (the book said 45 minutes). We had to go out of the house. When we came back I thought it would have collapsed. But, it was big, very big. It was a beautiful big lump of bubbly dough. I was almost afraid to touch it, but did it anyway. I gently placed my hands underneath the dough and gently lifted it to parchment paper on a peel. It was perfect and kept it shape well. Now I know to leave my bread in the oven until it has good brown color in stead of following the time given in the recipe. I left it in the oven for 12 minutes with steam and 33 minutes without steam. And then I left the Ciabatta in the oven with the door ajar for another 5 minutes. This whole process will help to get a crispy crust and full flavor development. Finally it was time to get it out and admire it and off course eat it! Mix yeast with the warm water, stir, and let it stand for 5 to 10 minutes. Mix the flours in a bowl. Measure 1/4 teaspoon of the yeasted water into the flour mixture and throw away the rest of the yeasted water. Then add the water (92.5 grams) using warmer water in winter and cold water in the summer. Mix by hand until the flour is absorbed. Cover with plastic bag and leave to ferment. This is a very stiff biga. It's ready in about 24 hours, when it's tripled in size. It may spend the day looking like it's doing nothing, but it will expand eventually. Combine flour, yeast and salt in bowl. Add the water and biga and knead untill all ingredients are well combined and forms a rough dough. On the counter I ‘kneaded’ (see above) the dough for 10 minutes until it scrapes the counter almost clean. Scrape the dough into a bowl and cover tightly with plastic. Let it ferment for 3 hours or until it doubles in size. Turn the dough 4 times at 20-minute intervals. After the bulk fermentation I scraped it very gently out of the bowl on a thick floured couche. I tucked it in and covered it with a tea towel. I didn’t pre shaped it, because there was not much to pre shape. I left it on the couche for more than one hour. When we came back I thought it had over proofed, but was great. I pre heated the oven with a steam pan, filled with stones, at 250˚C. As soon as the temperature was high enough I boiled 200 ml of water and very gently moved the dough to parchment paper on peel. I placed the loaf on the pizza stone (which is always in my oven) and quickly poured the boiling water on the hot stones in the steam pan and closed the door. I baked the Ciabatta for 12 minutes with steam and took the steam pan out, rotate the loaf, baked it 33 minutes with out steam. When it had a nice brown color I turned the oven off and left it with the door ajar for another 5 minutes. Cool on a rack and enjoy it!